All the latest iSize safety features. Maximum protection and comfort for your baby from 75 to 150 cm. An ever-growing child can quickly grow out of things. However, with the new Jané Drive iSize car seat and its easily adjustable headrest, you will know exactly when it’s safe to move up to the next age level – For children from 75 to 105 cm (approx. 15 months old all the way to 12 years old). 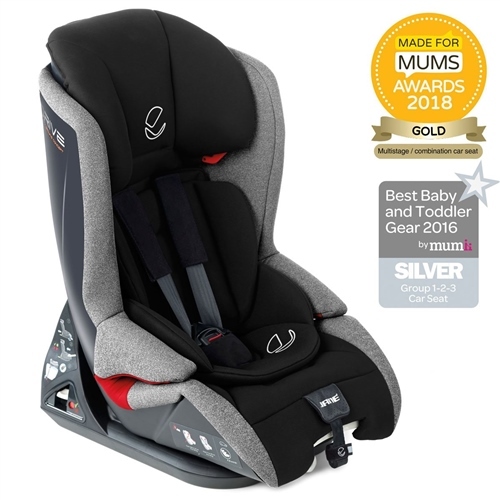 The car seat is first used with the cushion insert and a 5-point safety harness to fasten the child, before becoming a booster seat with backrest that uses the regular 3-point car seatbelt and optionally the Isofix anchors. The Jané Drive is designed to accommodate your growing child, while its enhanced safety features, like the “anti-misuse” straps and the impact adsorbing materials keep them safe along the way. Prevents any installation errors that could affect safety. Easy headrest adjustment to protect your child as they grow. Easy accessible reclining lever for your child's comfort. Longevity - this new evolutionary iSize car safety seat is designed to protect babies from 75 to 150 cm. approximately 15 months to 12 years. All the latest iSize safety features. Maximum protection and comfort for your baby from 75 to 150 cm. For children from 75 to 105 cm. Install with the Isofix anchors and anti-rotation strap (Top Tether). The child is held secure with the integrated 5-point seat belt. For children from 100 to 150 cm in height. The child is held secure with the vehicle 3-point seat belt and optionally the seat can be secured with the Isofix anchors. Adjustable headrest height, to protect the child better in the event of a side impact as it supports the head better. Adjustable backrest. Easy to reach reclining lever for the 3-position reclining seat. Cushion insert included in all the colours. Changing the “anti-misuse” straps. Switching to a booster seat with backrest without having to detach the integrated straps, simply conceal them, this prevents any installation errors that could affect safety. One pull adjustment strap for the integrated 5-point harness. Jané Drive & Grand car seat installation video. I-Size car seats will fit all i-Size certified cars and almost all cars with Isofix anchors. It is appropriate, in accordance with standard ECE 129/02, for general use in vehicles fitted with the ISOFIX system. It can be used in vehicles compatible with the ISOFIX class A, B and B2 categories. The Jané Crash Test Research Centre was built in 2003 when, as a result of our commitment to child safety, we decided to create our own crash test tunnel where we could test our seats to the limit to achieve a level of safety that goes beyond the legal requirements. All the Jané seats are created in the JANÉ CRASH TEST RESEARCH CENTER, the only private crash tunnel in Spain for researching child safety. As it is at our factory in Palau-Solità i Plegamans (Barcelona), we can use the Crash Test as much as is necessary (and then some more). And that's how we can offer you the most tested seats on the market with the strictest certification of Europe. Our car seats can be tested up to 250 times before being put on the market. We can stage crashes equivalent to 85 km/h (53 mph) in the car - much higher than the European Safety Regulations of 30 mph or ADAC crash tests at 40 mph.